Guwahati, India (AFP) – India on Monday effectively stripped four million people in Assam of citizenship, sparking fears of mass deportations of Muslims from the northeastern state. A new draft register of citizens includes only those able to prove they were in Assam before 1971, when millions fled Bangladesh’s war of independence into the state, and their descendants. Critics say it is the latest move by the right-wing government of Prime Minister Narendra Modi to bolster India’s Hindu majority at the expense of minorities. India will hold a national election next year. “No genuine Indian citizens need to worry as there will be ample opportunities given to them to enlist their names in the final list,” he told a news conference in Assam’s biggest city Guwahati. He said appeals could be made under “well-laid-down procedures” starting August 30. The definitive list is to be finalised in December. Modi’s Bharatiya Janata Party (BJP) won control of Assam in 2016 after promising to expel illegal immigrants from mainly Muslim Bangladesh and protect the rights of indigenous groups. Rights groups have criticised the government move, saying deletion from citizenship lists was similar to Myanmar’s removal of rights and protections for its Rohingya community in 1982. The country’s Supreme Court which has been supervising the registration, had initially set June 30 as the deadline to publish the draft list. “I am feeling good after seeing the name of mine and other four members of my family in the draft list,” Abdul Gani, a journalist based in Guwahati, told AFP. “No coercive action will be taken against anyone. Hence there is no need to panic,” Singh said in parliament. Satyendra Garg, a home ministry official who was at the Guwahati press conference, said there “was no question of sending anyone to detention camps based on the draft list”. The Assam controversy comes as the government looks at amending the citizenship law to allow certain “persecuted minorities”, including Hindus and Christians from neighbouring countries, to obtain legal status after six years of residency in India. Featured Photo: AFP/File / Kulendu Kalita. 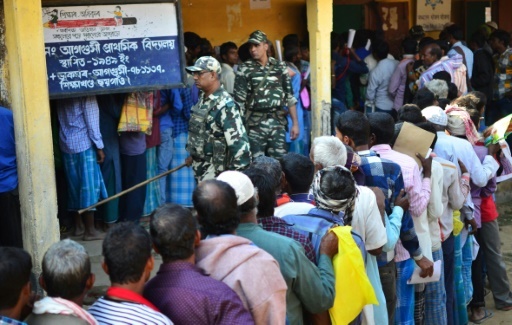 People stand in line to check their names on the first draft of the National Register of Citizens in Assam in January.